Cherry mobile is rolling out another practically-priced smartphone named Amethyst. Prospective buyers will not be disappointed as it is packed with decent specifications that offer a good value for money. Priced at Php 2,299, Amethyst will sure meet that budget requirement. And not just that, it gives you more than what you pay. Key features of this device are dual-SIM capability, 3.5-inch display, 3G connectivity, dual-core processor and Android Jellybean. Users will also benefit from the 2-megapixel rear camera and 0.3-megapixel front shooter. Memory-wise, Amethyst packs 2GB of internal storage which is expandable up to 32GB through microSD slot. This “treasures need not be expensive” smartphone can capture wonderful moments and store unforgettable memories. 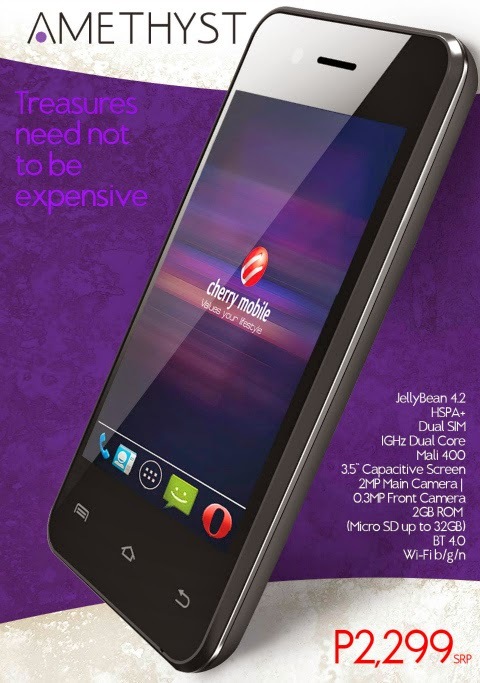 The Cherry Mobile Amethyst is available in selected CM concept stores nationwide.